What, exactly, is espresso? In fact, espresso is neither a type of coffee bean, nor a roast at all. Espresso coffee is often a blend of several roasts or varietals to form not a bitter or necessarily pungent flavor, but a bold and powerful one. Finely ground coffee is tightly compressed into a "portafilter". High pressure water is forced through the ground to produce intense, delicious shots of espresso. 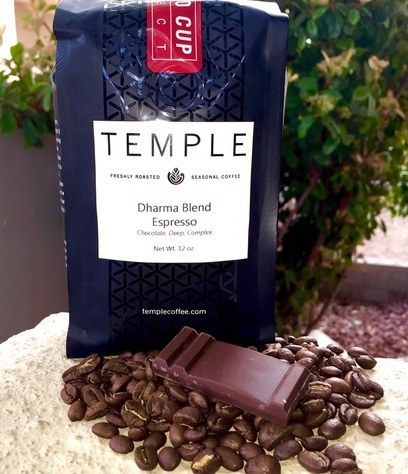 Popular acclaim for Temple Coffee's Dharma Espresso Blend is well-deserved; designed meticulously and masterfully for the espresso machine, this blend combines a pleasant acidity, deep chocolate tones, and a rich, complex body to achieve a coffee that is as dominating as it is delicious. Not to mention the Dharma blend performs just as well in a French Press or pour-over as it does in espresso; espresso beans are just as applicable to home brewing systems as they are in commercial ones. Thanks to Temple Coffee for sending these in!